I really enjoy my membership in the Utah County Modern Quilt Group (UCMQG). You won’t find a nicer group of women anywhere, and it is always fun to see what everyone is making. I feel like I’ve had very little time to sew in the past few months, so I haven’t been sharing much at our meetings. In September I had the opportunity to pick a pattern/tutorial on the Moda Bakeshop site, make it and review the pattern. We shared what we did at UCMQG. I was assigned the holiday section of the website, and one of the first things I realized about that category is that really, the majority of the projects aren’t strictly “holiday” projects. Most of them are made from holiday fabric, which is why they’re labeled as such, but the actual design could be used in many other ways. If you check out the original post, you’ll see that the stars are a beautiful blue paisley, and the stripes are a red solid. I was tempted to go in search of a lovely blue floral and replicate the color scheme of the quilt, but decided in the end to practice what I preach and try it in a non-holiday color scheme. I’m really loving this green floral fabric by Jennifer Paganelli for JoAnn’s, so it was my starting point. I found a small scale blue floral for the stripes and went to work. 1. The pattern is well-written and easy to follow. 2. This is a very fast project, made with only two kinds of blocks, especially with the adjustments I made in piecing it. It would be a great first quilt for teaching someone the basics of quilting, and would also be a good introduction to half square triangles. Learning to choose two fabric prints that pair well in color and scale would come with this project. This would also make a really quick baby quilt (at 5 x 5 blocks). 3. The more rows I added to the quilt, the more I liked it. I ended with seven rows of seven blocks. 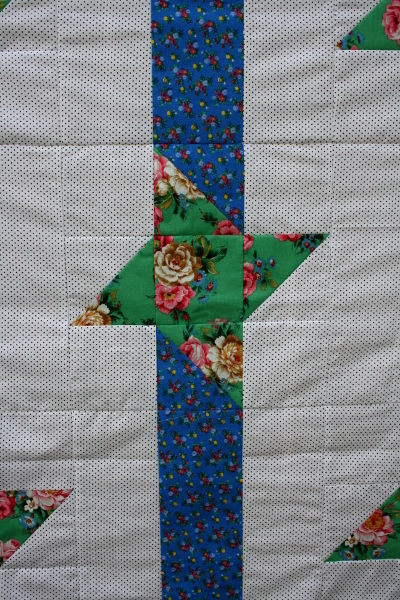 There is a lot of negative space in the quilt, which made me happy I used a tiny polka dot print instead of a solid. For some reason I noticed the negative space more in my own project than I did in the photos on Moda Bakeshop. I’m hoping that quilting it will make me like that more. 4. 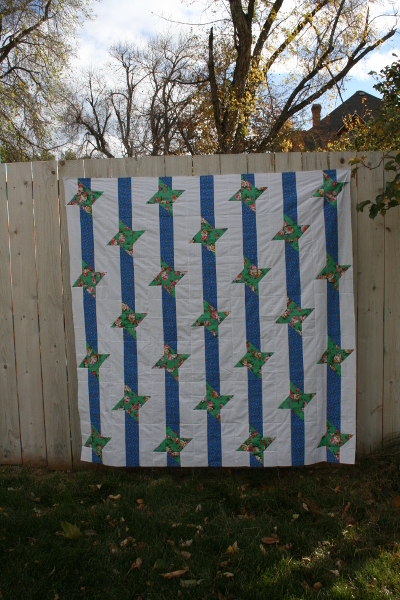 IT’S MUCH FASTER AND EASIER TO PIECE THIS QUILT IN VERTICAL ROWS THAN IN HORIZONTAL ONES! Make each vertical stripe separately and them sew them all together. You’ll have fewer seams to match as you sew your rows together, making accuracy easier to achieve. 1. Sometimes the Moda Bakeshop tutorials don’t use the most effective fabric cuts, because they are designed to use Moda precuts. I felt that this quilt fell into that category. 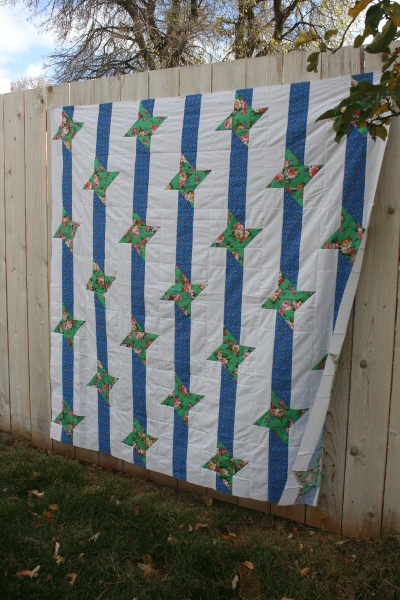 It called for a layer cake of both the stripe fabric (in my quilt, the blue stripes) and the background fabric. However, if you use layer cakes, you’re cutting two 3.5 inch strips from the ten inch square, leaving 3 inches of wasted fabric. In my opinion, that is not the most effective use of fabric. I think this quilt makes more sense using yardage, which was what I did. Because I did that, I could do a lot of strip piecing. Half of the blocks in the quilt were finished in just a few minutes by sewing together three strips and then cutting the blocks down to 9.5 inches square. If it helps, I got 4 blocks out of every strip set (2 – 3.5″ strips x WOF background and 1 – 3.5″ strip x WOF blue). 2. I also chose to chain piece my friendship star blocks together, which helped with speed. 3. 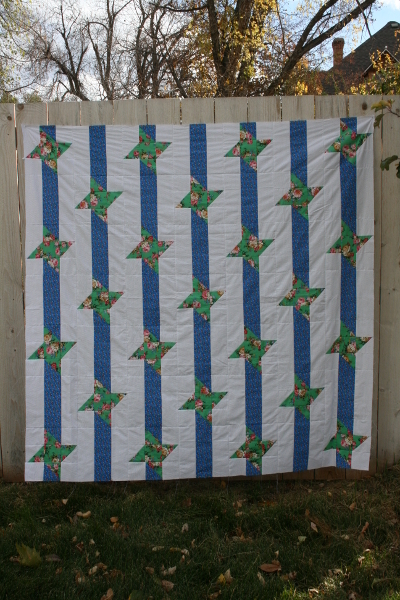 I chose to make my quilt to square in size because I wanted to have a star in every corner of the quilt. I like the symmetry of it. So, the top is done and backing & binding are waiting. This will make a great play quilt for my daughters, who love to play outside with their neighborhood friends. I’m also excited to practice my free motion quilting on this quilt top. 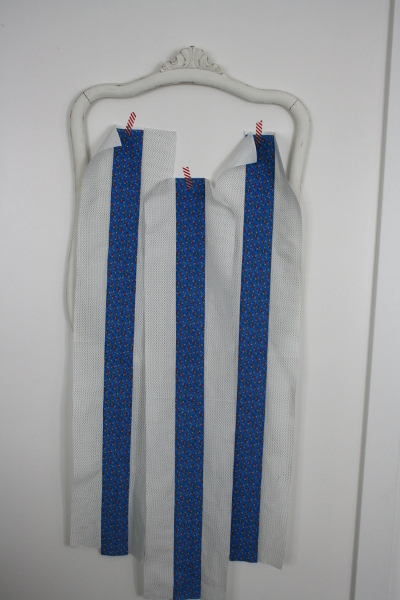 I am grateful to have had an assignment and a deadline, which meant I did a little sewing! Also, stay tuned to see another, miniature, scrappy version of this quilt – I really loved how it turned out!